The BIG YES SOCIETY DISCUSSION GROUP will discuss Always Look on the Bright Side: Celebrating Each Day to the Fullest by Allen Klein. Allen Klein's book Mom's the Word was available from LibraryThing Early Reviewers. Allen Klein's book Having the Time of Your Life: Little Lessons to Live By was available from LibraryThing Member Giveaway. Allen Klein's book Change Your Life! was available from LibraryThing Member Giveaway. 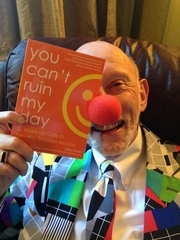 Allen Klein's book Always Look on the Bright Side was available from LibraryThing Member Giveaway. Allen Klein is currently considered a "single author." If one or more works are by a distinct, homonymous authors, go ahead and split the author. Allen Klein is composed of 1 name.